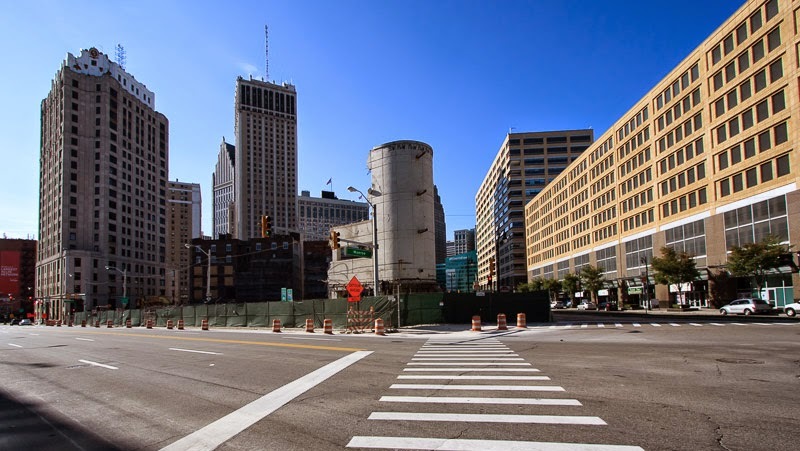 The corner of Willis and Woodward has come alive as crews have begun excavating the future site of Lawrence Technical University's Detroit Center for Design + Technology. 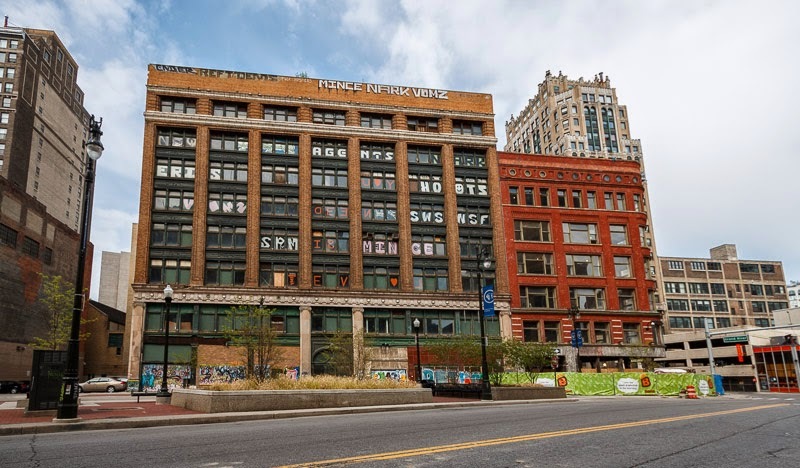 The 30,000 square foot building will house LTU's Detroit Studio, along with Evans Architects Inc, DetroitSHOP, Studio Couture and Invest Detroit. 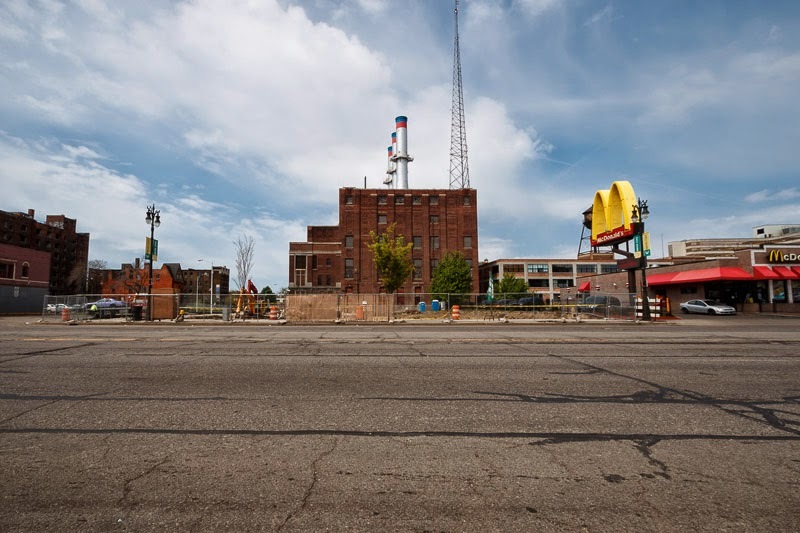 The facility is being constructed on the site of long since demolished Greystone Ballroom. 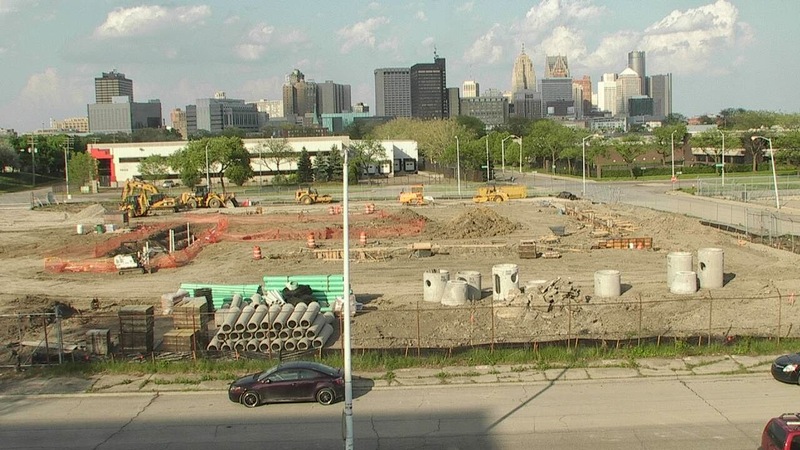 Well, we now know what the webcam that had been documenting the construction of The Z has been focusing on since the completion of that 10-story parking garage. 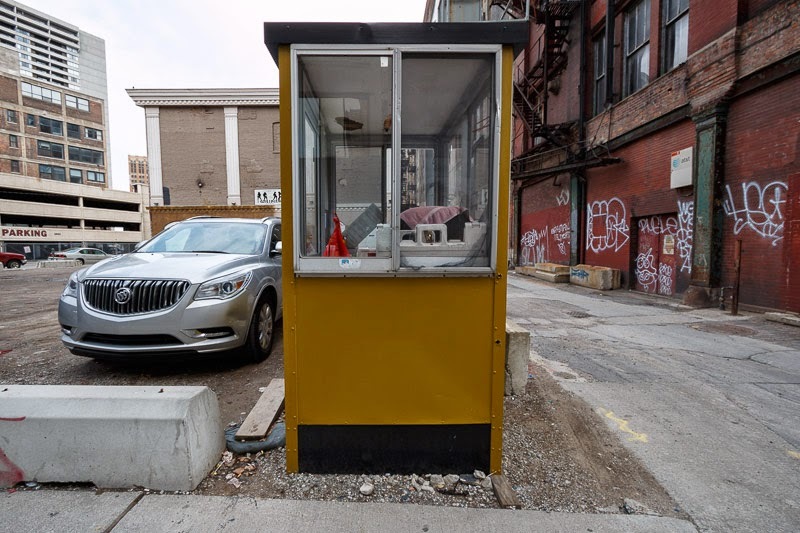 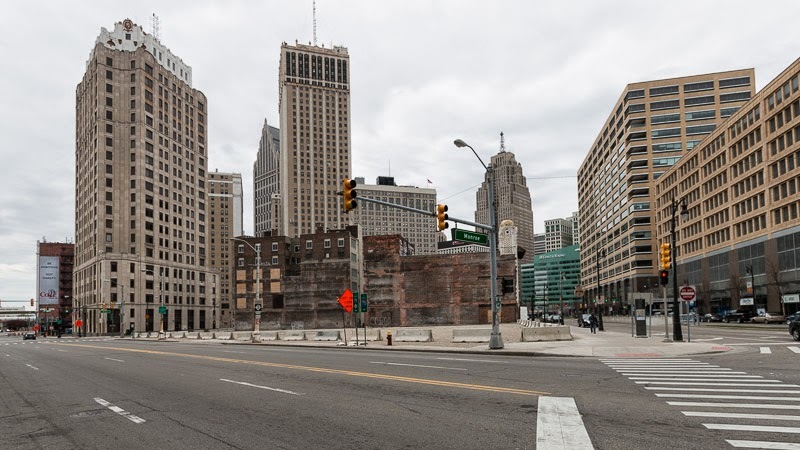 It turns out that the camera has been relocated to a lofty position in Corktown overlooking the construction of Dan Gilbert's new 66,000-square-foot data center and office complex. 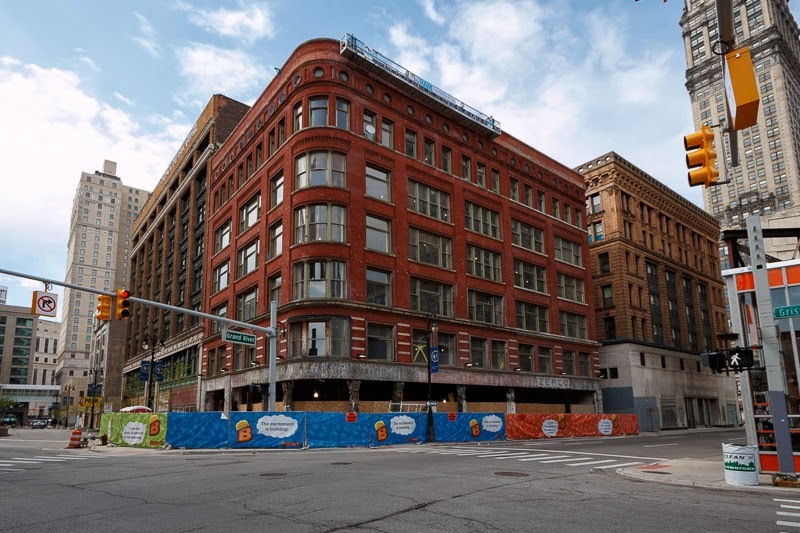 Half of the building located at Rosa Parks and Porter Street will be used to house data servers and technology staff for Quicken Loans. 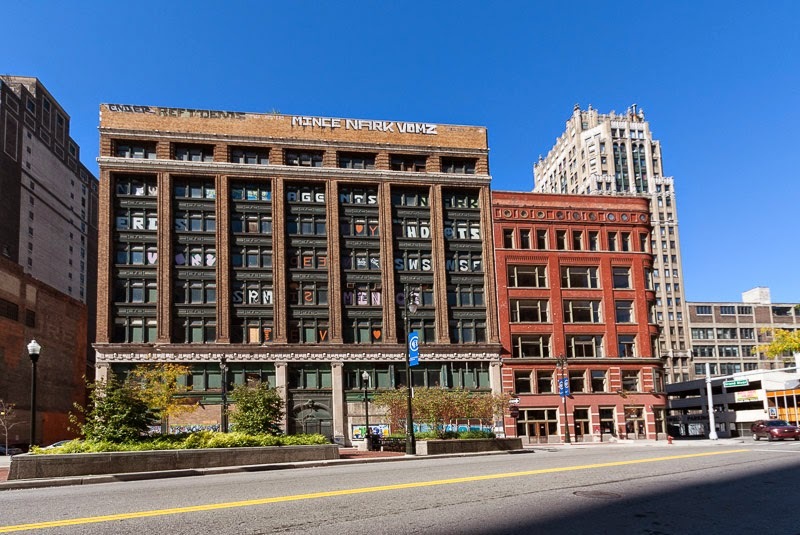 The remainder of the office space, along with a portion of the server capacity, will be available for lease. 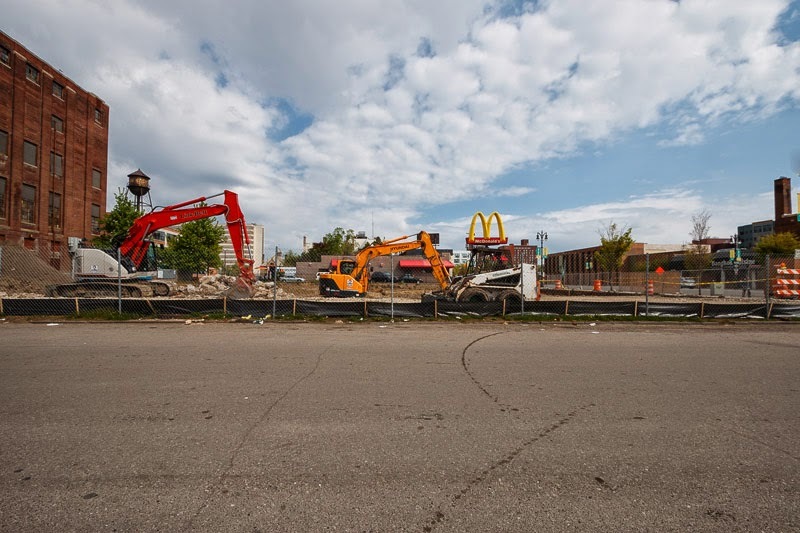 Work is scheduled to be be completed by January of 2015. 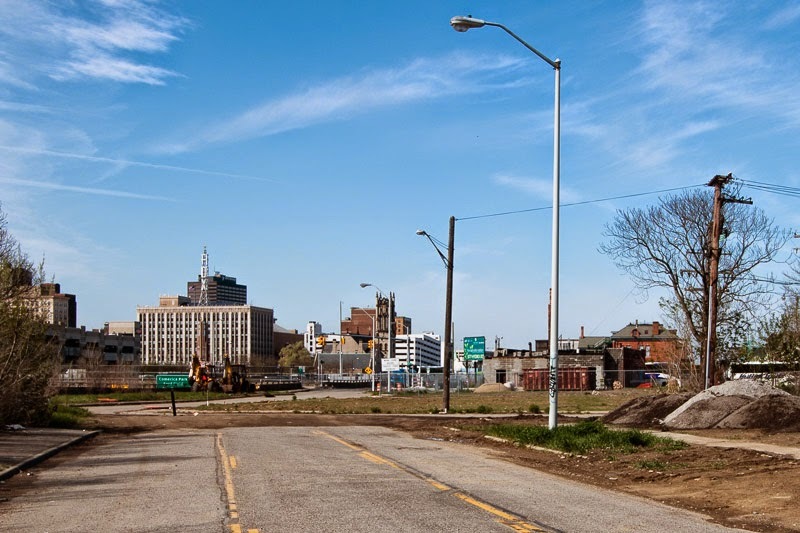 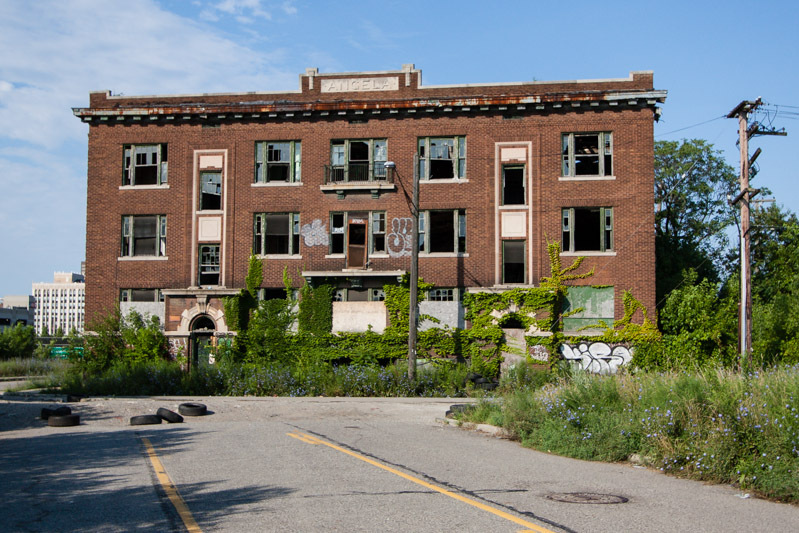 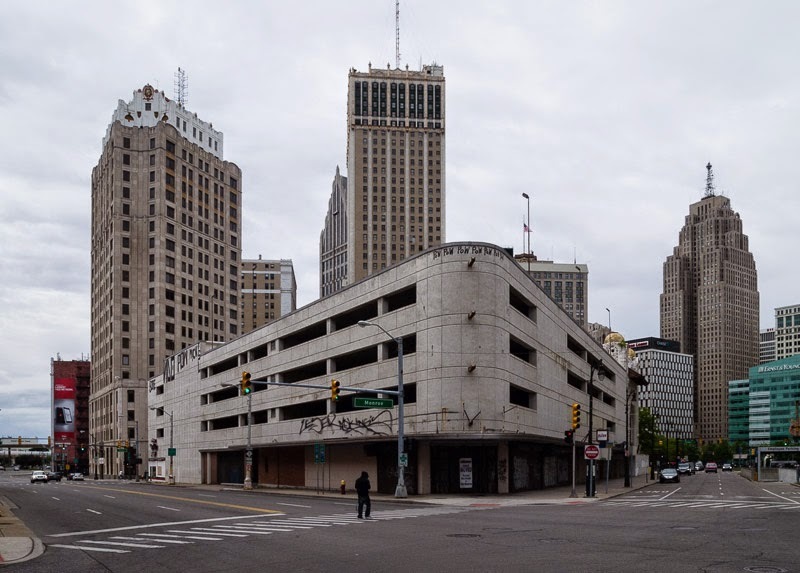 As we noted back in July of 2013, when the city of Detroit filed for bankruptcy, it listed several city properties that pose an "Imminent and identifiable harm to the public health or safety." 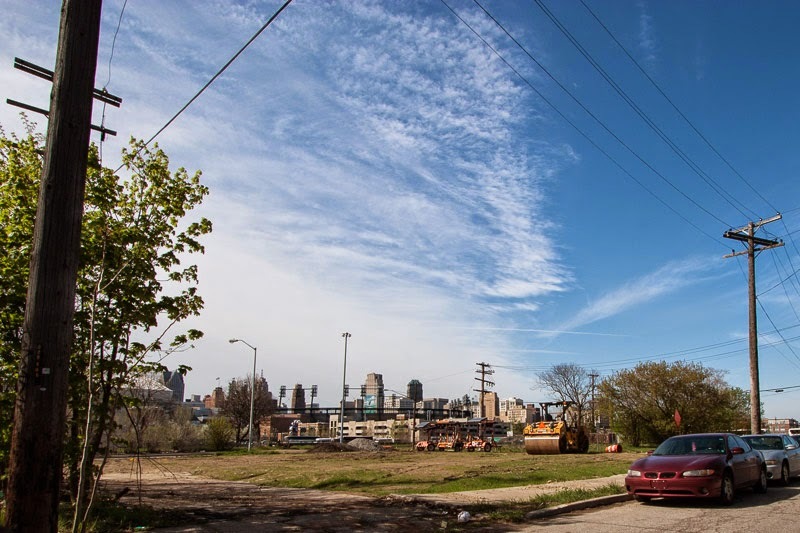 That list contained a number of properties within Brush Park that were scheduled to be demolished. 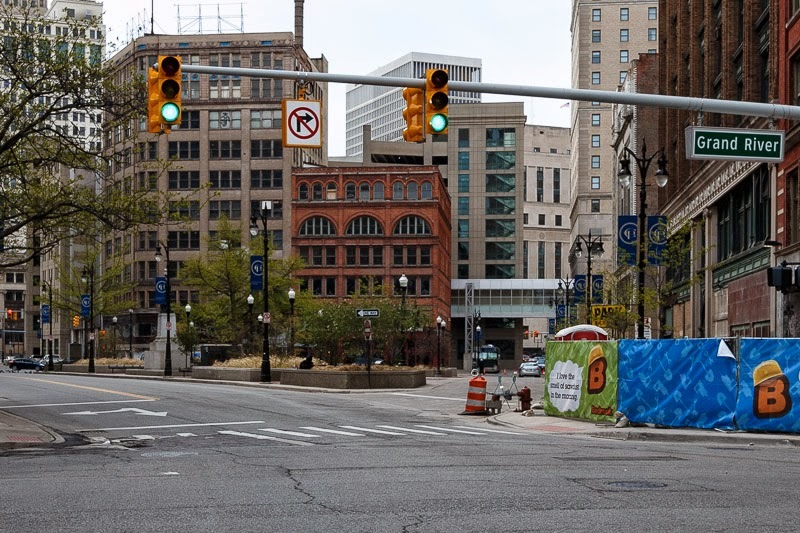 It appears that the city has remained true to its word. 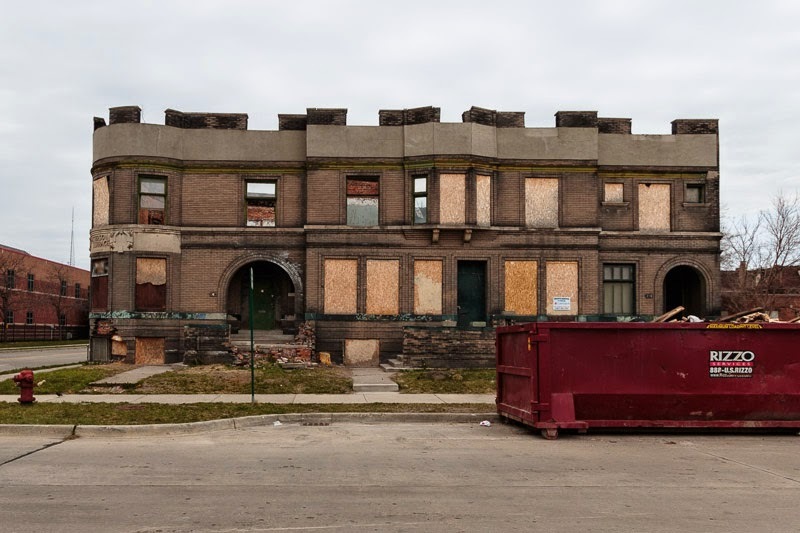 The Angela and another unnamed apartment building at the corner of Winder and Beaubiean have already been demolish. 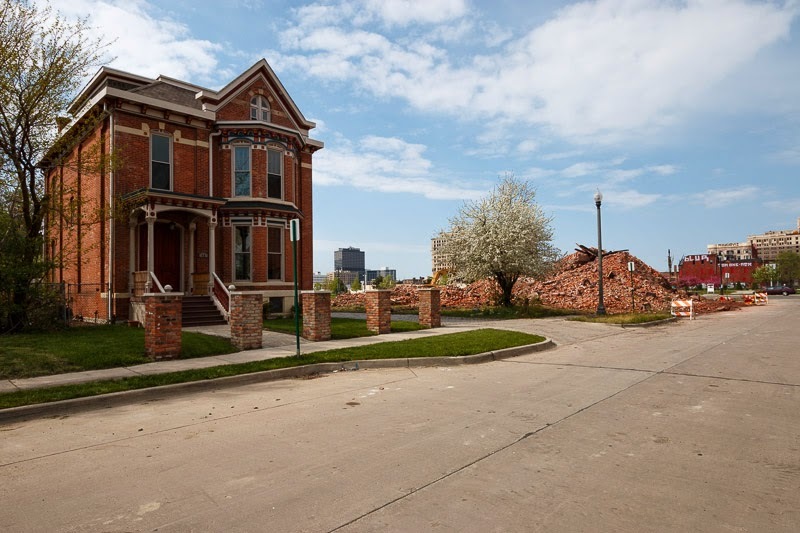 Clean up work has also started on Patterson Terrace. 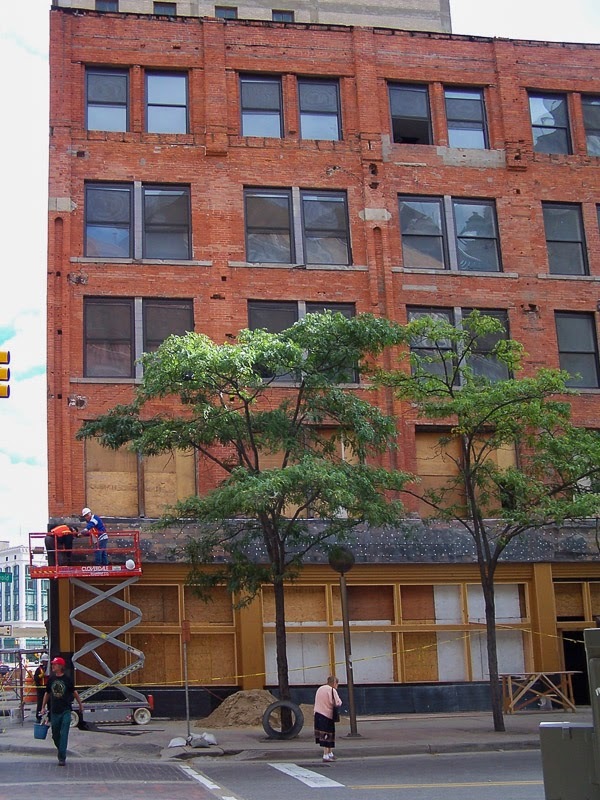 However, it remains to be seen if this is prep work for another demolition or the beginning of a renovation. 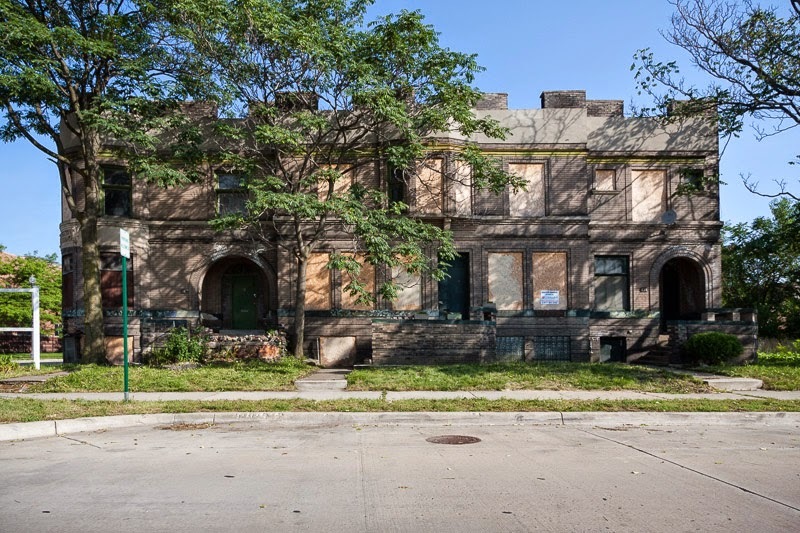 The city only owns of one the seven units in Patterson Terrace and it is neither of the units they claimed on their 2013 filing. 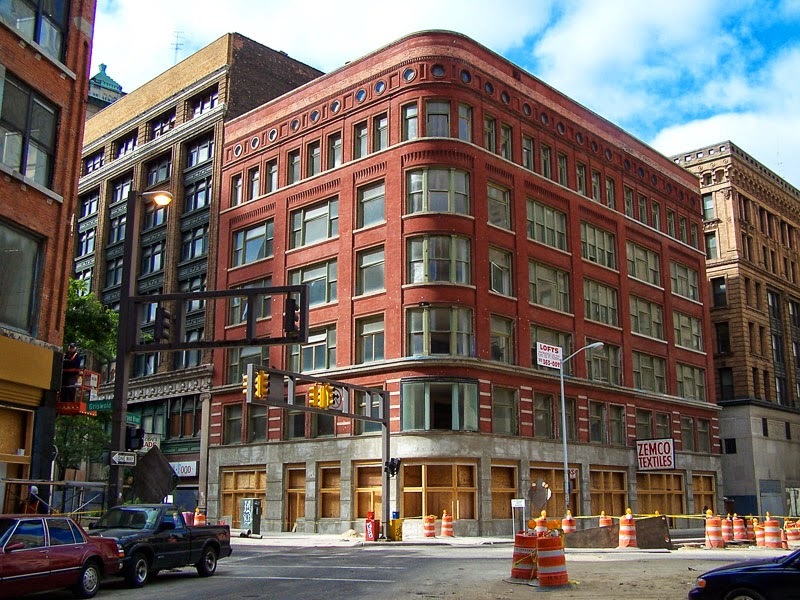 Almass Downtown Real Estate owns three units and Elana McKinney owns the remaining three. 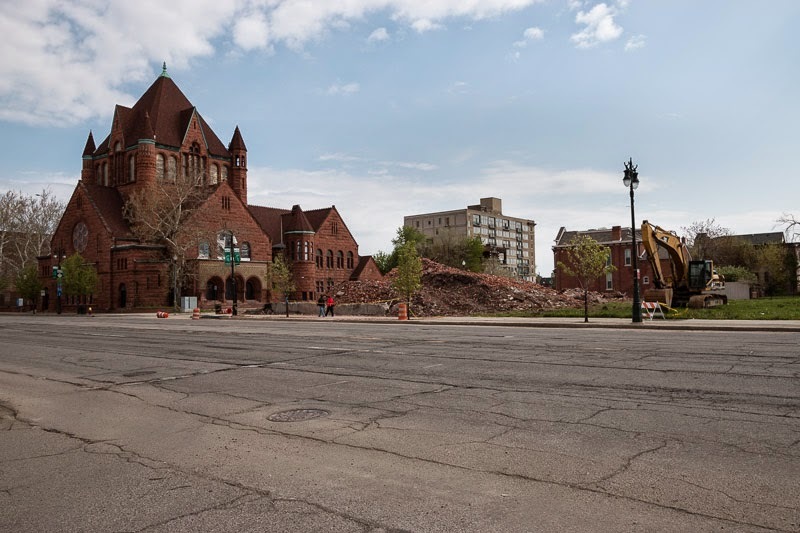 Almass has applied to purchase the city owned unit, but neither Almass nor Mckinney have filed a request to remove the building from the emergency demo list. 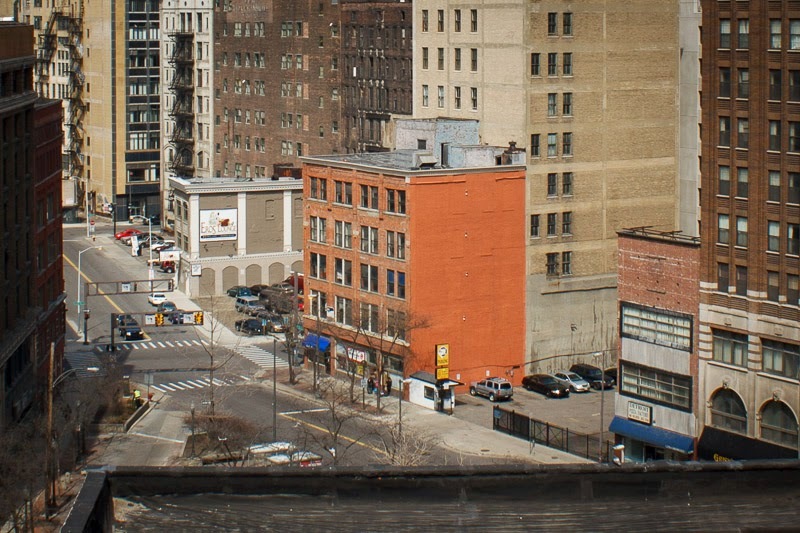 It will be interesting to see how this all plays out. 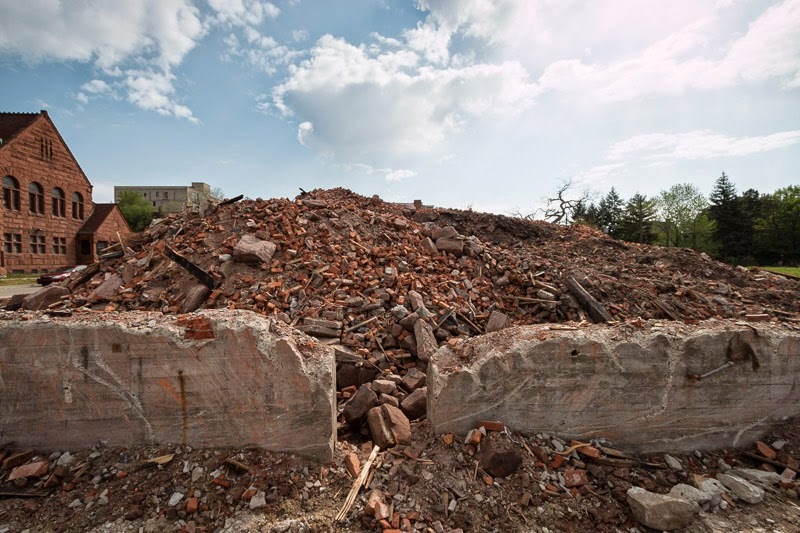 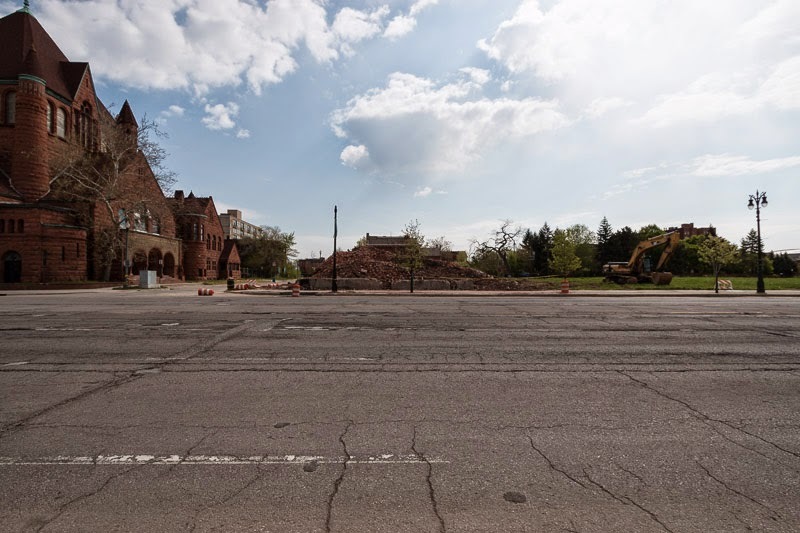 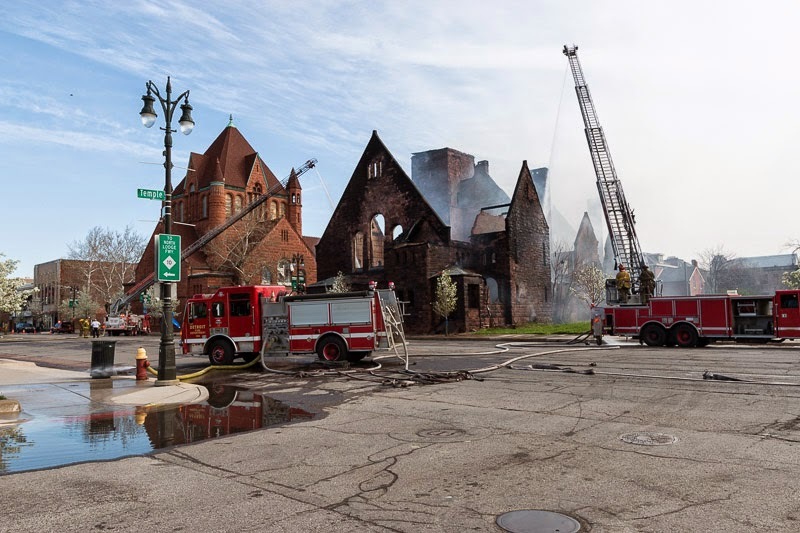 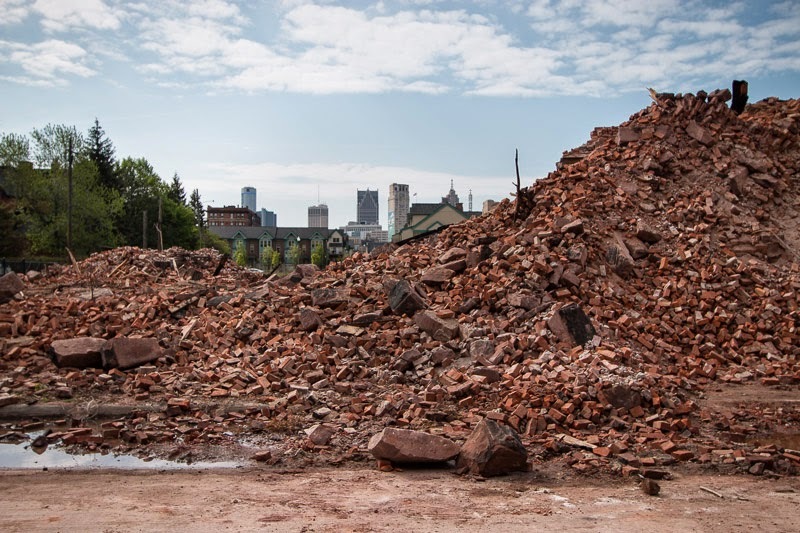 Demolition came swift for the remains of First Unitarian Church of Detroit. 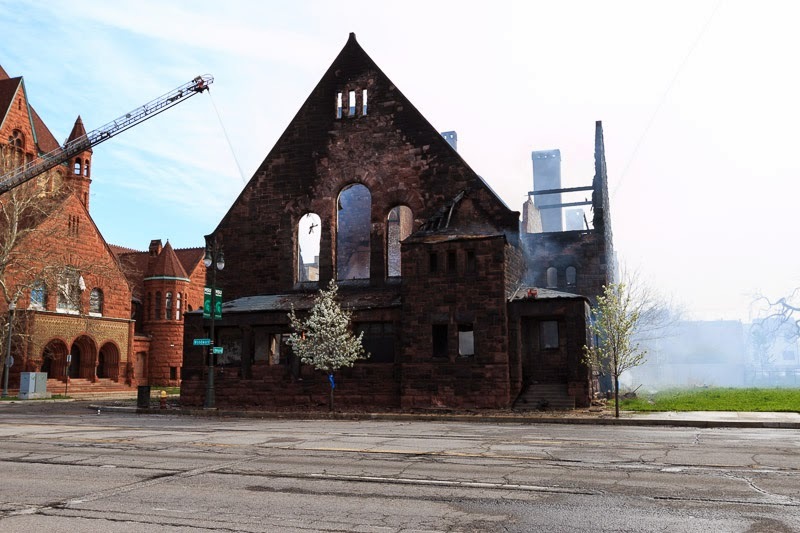 First Unitarian Church on Woodward in Midtown was originally built in 1890, and partially redesigned for the widening of Woodward in the mid-1930s. 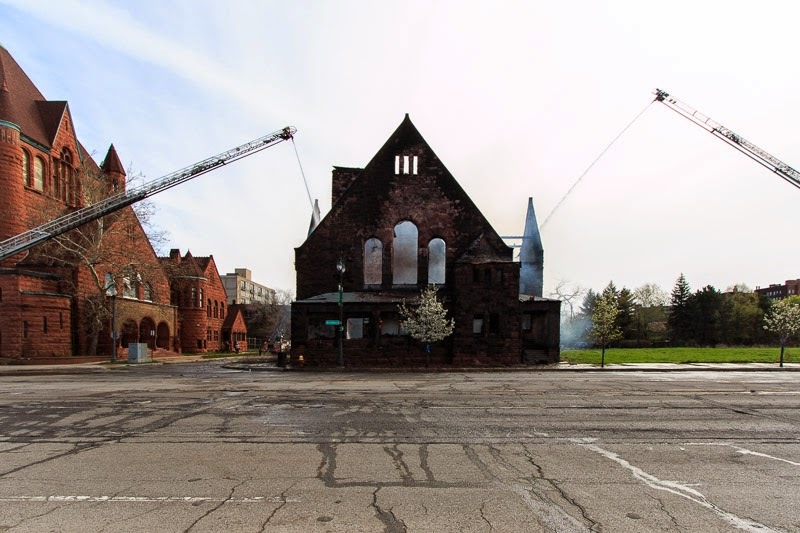 Passing hands through multiple denominations after the Unitarians left it for a new home on Cass in the late 1930s, its sanctuary remained largely in-tact until it was hit by several fires in the 2000s. 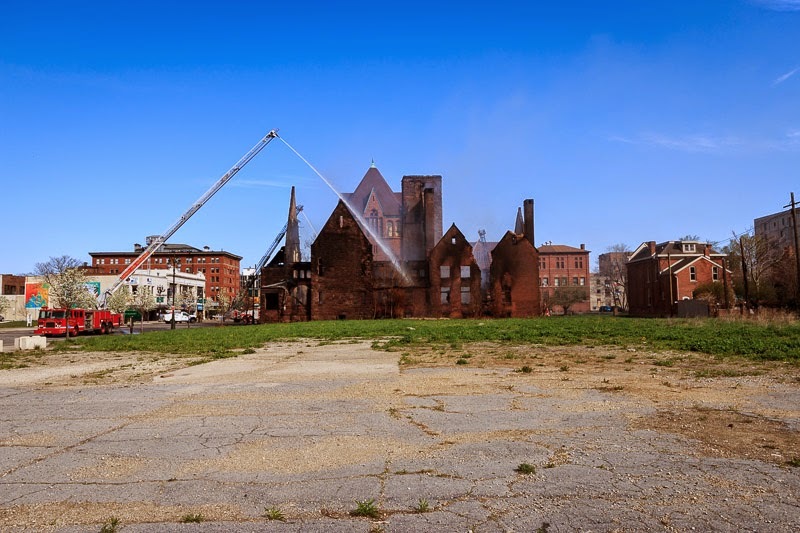 It has been abandoned for some time and on the morning of May 10, 2014 it was completely destroyed by a fire. 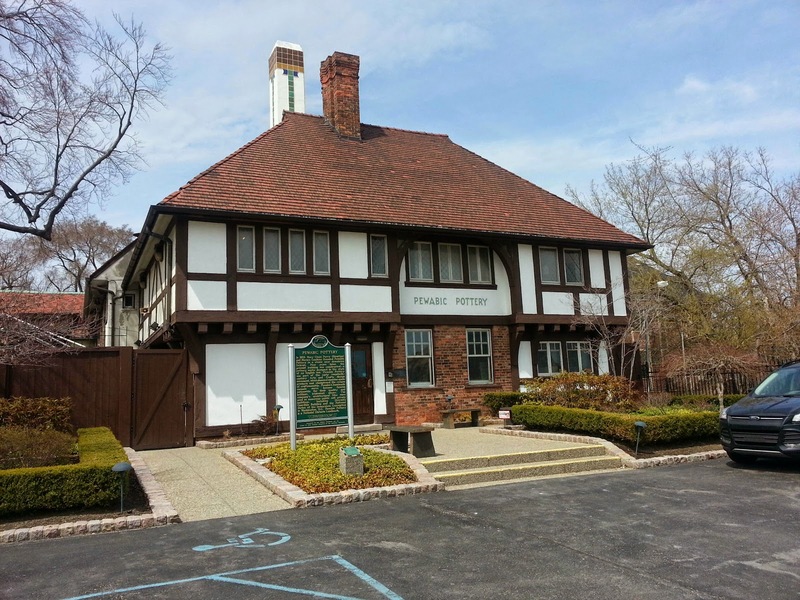 The Pewabic Pottery Company was founded in 1904 by Mary Chase Perry, one of the leaders of the city's turn-of-the-century Arts and Crafts movement.Three years later, she attained a beautiful building on Jefferson Avenue to house the new company, designed by her good friend who would later become her husband, architect William B Stratton. 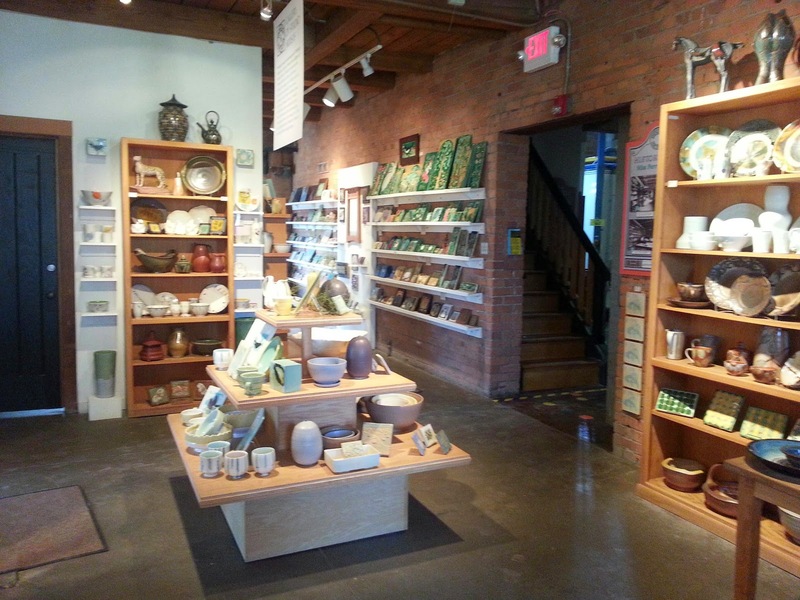 The cozy look both inside and out provided the right atmosphere for a small-scale handicraft industry. 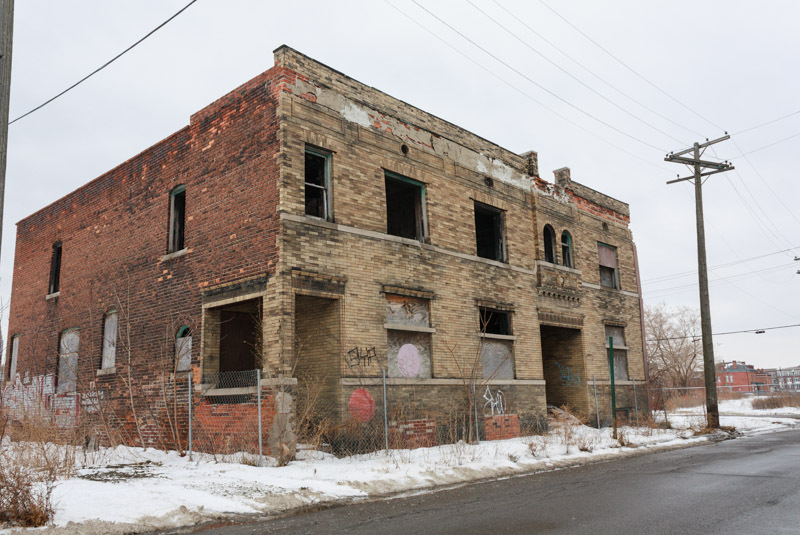 The building today is a National Historic Landmark. 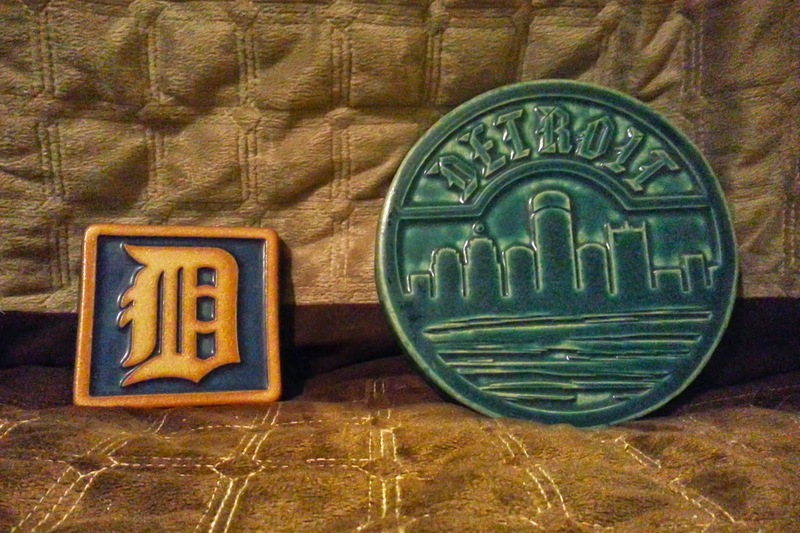 A countless number of the city's most prestigious homes and buildings include Pewabic tiles, among them the Guardian Building and the Detroit Institute of Arts.